Carl Richard Woese (/ˈwoʊz/; July 15, 1928 – December 30, 2012) was an American microbiologist and biophysicist. Woese is famous for defining the Archaea (a new domain or kingdom of life) in 1977 by phylogenetic taxonomy of 16S ribosomal RNA, a technique pioneered by Woese which revolutionized the discipline of microbiology. He was also the originator of the RNA world hypothesis in 1967, although not by that name. He held the Stanley O. Ikenberry Chair and was professor of microbiology at the University of Illinois at Urbana–Champaign. Woese attended Deerfield Academy in Massachusetts. He received a bachelor's degree in mathematics and physics from Amherst College in 1950. During his time at Amherst, Woese took only one biology course (Biochemistry, in his senior year) and had "no scientific interest in plants and animals" until advised by William M. Fairbank, then an assistant professor of physics at Amherst, to pursue biophysics at Yale. In 1953, he completed a Ph.D. in biophysics at Yale University, where his doctoral research focused on the inactivation of viruses by heat and ionizing radiation. He studied medicine at the University of Rochester for two years, quitting two days into a pediatrics rotation. Then he became a postdoctoral researcher in biophysics at Yale University investigating bacterial spores. From 1960–63, he worked as a biophysicist at the General Electric Research Laboratory in Schenectady, New York. In 1964, Woese joined the microbiology faculty of the University of Illinois at Urbana–Champaign, where he focused on Archaea, genomics, and molecular evolution as his areas of expertise. He became a professor at the University of Illinois at Urbana–Champaign's Carl R. Woese Institute for Genomic Biology, which was renamed in his honor in 2015, after his death. Woese died on December 30, 2012, following complications from pancreatic cancer. Woese turned his attention to the genetic code while setting up his lab at General Electric's Knolls Laboratory in the fall of 1960. Interest among physicists and molecular biologists had begun to coalesce around deciphering the correspondence between the twenty amino acids and the four letter alphabet of nucleic acid bases in the decade following James D. Watson, Francis Crick, and Rosalind Franklin's discovery of the structure of DNA in 1953. Woese published a series of papers on the topic. In one, he deduced a correspondence table between what was then known as "soluble RNA" and DNA based upon their respective base pair ratios. He then re-evaluated experimental data associated with the hypothesis that viruses used one base, rather than a triplet, to encode each amino acid, and suggested 18 codons, correctly predicting one for proline. Other work established the mechanistic basis of protein translation, but in Woese's view, largely overlooked the genetic code's evolutionary origins as an afterthought. In 1962 Woese spent several months as a visiting researcher at the Pasteur Institute in Paris, a locus of intense activity on the molecular biology of gene expression and gene regulation. While in Paris, he met Sol Spiegelman, who invited Woese to visit the University of Illinois after hearing his research goals; at this visit Spiegelman offered Woese a position with immediate tenure beginning in the fall of 1964. With the freedom to patiently pursue more speculative threads of inquiry outside the mainstream of biological research, Woese began to consider the genetic code in evolutionary terms, asking how the codon assignments and their translation into an amino acid sequence might have evolved. For much of the 20th century, prokaryotes were regarded as a single group of organisms and classified based on their biochemistry, morphology and metabolism. In a highly influential 1962 paper, Roger Stanier and C. B. van Niel first established the division of cellular organization into prokaryotes and eukaryotes, defining prokaryotes as those organisms lacking a cell nucleus. Adapted from Édouard Chatton's generalization, Stanier and Van Niel's concept was quickly accepted as the most important distinction among organisms; yet they were nevertheless skeptical of microbiologists' attempts to construct a natural phylogenetic classification of bacteria. However, it became generally assumed that all life shared a common prokaryotic (implied by the Greek root πρό (pro-), before, in front of) ancestor. In 1977, Carl Woese and George E. Fox experimentally disproved this universally held hypothesis about the basic structure of the tree of life. Woese and Fox discovered a kind of microbial life which they called the “archaebacteria” (Archaea). They reported that the archaebacteria comprised "a third kingdom" of life as distinct from bacteria as plants and animals. Having defined Archaea as a new "urkingdom" (later domain) which were neither bacteria nor eukaryotes, Woese redrew the taxonomic tree. His three-domain system, based on phylogenetic relationships rather than obvious morphological similarities, divided life into 23 main divisions, incorporated within three domains: Bacteria, Archaea, and Eucarya. Acceptance of the validity of Woese's phylogenetically valid classification was a slow process. Prominent biologists including Salvador Luria and Ernst Mayr objected to his division of the prokaryotes. Not all criticism of him was restricted to the scientific level. A decade of labor-intensive oligonucleotide cataloging left him with a reputation as "a crank," and Woese would go on to be dubbed as "Microbiology's Scarred Revolutionary" by a news article printed in the journal Science. The growing amount of supporting data led the scientific community to accept the Archaea by the mid-1980s. Today, few scientists cling to the idea of a unified Prokarya. Woese's work on Archaea is also significant in its implications for the search for life on other planets. Before the discovery by Woese and Fox, scientists thought that Archaea were extreme organisms that evolved from the organisms more familiar to us. Now, most believe they are ancient, and may have robust evolutionary connections to the first organisms on Earth. Organisms similar to those archaea that exist in extreme environments may have developed on other planets, some of which harbor conditions conducive to extremophile life. Notably, Woese's elucidation of the tree of life shows the overwhelming diversity of microbial lineages; single-celled organisms represent the vast majority of the biosphere's genetic, metabolic, and ecologic niche diversity. As microbes are crucial for many biogeochemical cycles and to the continued function of the biosphere, Woese's efforts to clarify the evolution and diversity of microbes provided an invaluable service to ecologists and conservationists. It was a major contribution to the theory of evolution and to our knowledge of the history of life. Woese also speculated about an era of rapid evolution in which considerable horizontal gene transfer occurred between organisms. First described by Woese and Fox in a 1977 paper, these organisms, or progenotes, were protocells that exhibited a far lower level of complexity due to their error-prone translation apparatus ("noisy genetic transmission channel") that produced high mutation rates which constrained the specificity of cellular interaction and limited genome size. This early translation apparatus would have produced a group of similar, yet functionally equivalent, proteins, rather than a single protein. Furthermore, because of this reduced specificity, all cellular components were susceptible to HGT, and rapid evolution occurred at the level of the ecosystem. The transition to modern cells (the "Darwinian Threshold") occurred when organisms evolved translation mechanisms with modern levels of fidelity; improved performance allowed cellular organization to reach a level of complexity and connectedness that made genes from other organisms much less able to displace an individual's own genes. Horizontal gene transfer during this era was responsible for the fast early evolution of complex biological structures. In later years, Woese's work concentrated on genomic analysis to elucidate the significance of horizontal gene transfer (HGT) for evolution. He worked on detailed analyses of the phylogenies of the aminoacyl-tRNA synthetases and on the effect of horizontal gene transfer on how those key enzymes are distributed among organisms. The goal of the research was to explain how the primary cell types (the archaeal, eubacterial, and eukaryotic) evolved, from some ancestral state in the RNA world. The "important questions" that 21st century biology faces all stem from a single question, the nature and generation of biological organization. . . . Yes, Darwin is back, but in the company of . . . scientists who can see much further into the depths of biology than was possible heretofore. It is no longer a "10,000 species of birds" view of evolution—evolution seen as a procession of forms. The concern is now with the process of evolution itself. I see the question of biological organization taking two prominent directions today. The first is the evolution of (proteinaceous) cellular organization, which includes sub-questions such as the evolution of the translation apparatus and the genetic code, and the origin and nature of the hierarchies of control that fine-tune and precisely interrelate the panoply of cellular processes that constitute cells. It also includes the question of the number of different basic cell types that exist on earth today: did all modern cells come from a single ancestral cellular organization? The second major direction involves the nature of the global ecosystem. . . . Bacteria are the major organisms on this planet—in numbers, in total mass, in importance to the global balances. Thus, it is microbial ecology that . . . is most in need of development, both in terms of facts needed to understand it, and in terms of the framework in which to interpret them. What was formally recognized in physics needs now to be recognized in biology: science serves a dual function. On the one hand it is society's servant, attacking the applied problems posed by society. On the other hand, it functions as society's teacher, helping the latter to understand its world and itself. It is the latter function that is effectively missing today. Woese was a MacArthur Fellow in 1984, was made a member of the National Academy of Sciences in 1988, received the Leeuwenhoek Medal (microbiology's highest honor) in 1992, the Selman A. Waksman Award in Microbiology in 1995 from the National Academy of Sciences, and was a National Medal of Science recipient in 2000. In 2003, he received the Crafoord Prize from the Royal Swedish Academy of Sciences "for his discovery of a third domain of life". In 2006, he was made a foreign member of the Royal Society. Many microbial species, such as Pyrococcus woesei, Methanobrevibacter woesei, and Conexibacter woesei, are named in his honor. Microbiologist Justin Sonnenburg of Stanford University said "The 1977 paper is one of the most influential in microbiology and arguably, all of biology. It ranks with the works of Watson and Crick and Darwin, providing an evolutionary framework for the incredible diversity of the microbial world". With regard to Woese's work on horizontal gene transfer as a primary evolutionary process, Professor Norman R. Pace of the University of Colorado at Boulder said, "I think Woese has done more for biology writ large than any biologist in history, including Darwin... There's a lot more to learn, and he's been interpreting the emerging story brilliantly". Woese, Carl (1967). The Genetic Code: the Molecular Basis for Genetic Expression. New York: Harper & Row. OCLC 293697. Woese, Carl R.; George E. Fox (1977). "Phylogenetic structure of the prokaryotic domain: the primary kingdoms". Proceedings of the National Academy of Sciences of the United States of America. 74 (11): 5088–5090. Bibcode:1977PNAS...74.5088W. doi:10.1073/pnas.74.11.5088. ISSN 0027-8424. PMC 432104 . PMID 270744. Woese, Carl R. (1987-06-01). "Bacterial evolution". Microbiological Reviews. 51 (2): 221–271. PMC 373105 . PMID 2439888. Woese, Carl R.; O Kandler; M L Wheelis (1990). "Towards a natural system of organisms: proposal for the domains Archaea, Bacteria, and Eucarya". Proceedings of the National Academy of Sciences of the United States of America. 87 (12): 4576–4579. Bibcode:1990PNAS...87.4576W. doi:10.1073/pnas.87.12.4576. ISSN 0027-8424. PMC 54159 . PMID 2112744. Woese, Carl R. (2004-06-01). "A New Biology for a New Century". Microbiology and Molecular Biology Reviews. 68 (2): 173–186. doi:10.1128/MMBR.68.2.173-186.2004. ISSN 1098-5557. PMC 419918 . PMID 15187180. Woese, Carl R. (2006). "How We Do, Don't and Should Look at Bacteria and Bacteriology". The Prokaryotes. pp. 3–23. doi:10.1007/0-387-30741-9_1. ISBN 978-0-387-30741-1. Woese, Carl R.; Nigel Goldenfeld (2009). "How the Microbial World Saved Evolution from the Scylla of Molecular Biology and the Charybdis of the Modern Synthesis". Microbiology and Molecular Biology Reviews. 73 (1): 14–21. doi:10.1128/MMBR.00002-09. PMC 2650883 . PMID 19258530. ↑ Hagen (ed. ), Ray (August 2012). "Say How? A Pronunciation Guide to Names of Public Figures". National Library Service for the Blind and Physically Handicapped. 1 2 3 Woese, Carl R.; Kandler, O; Wheelis, M (1990). "Towards a natural system of organisms: proposal for the domains Archaea, Bacteria, and Eucarya". Proc Natl Acad Sci USA. 87 (12): 4576–9. Bibcode:1990PNAS...87.4576W. doi:10.1073/pnas.87.12.4576. PMC 54159 . PMID 2112744. ↑ Woese, C.R. ; Magrum, L.J. ; Fox, G.E. (1978). "Archaebacteria". J Mol Evol. 11 (3): 245–51. doi:10.1007/BF01734485. PMID 691075. 1 2 3 Woese, C. R.; G. E. Fox (1977-11-01). "Phylogenetic structure of the prokaryotic domain: The primary kingdoms". Proceedings of the National Academy of Sciences. 74 (11): 5088–5090. Bibcode:1977PNAS...74.5088W. doi:10.1073/pnas.74.11.5088. ISSN 0027-8424. PMC 432104 . PMID 270744. 1 2 Morell, V (1997-05-02). "Microbiology's scarred revolutionary". Science. 276 (5313): 699–702. doi:10.1126/science.276.5313.699. ISSN 0036-8075. PMID 9157549. ↑ Woese, Carl (1967). The Genetic Code: the Molecular basis for Genetic Expression. New York: Harper & Row. ↑ Noller, H. (2013). "Carl Woese (1928–2012) Discoverer of life's third domain, the Archaea". Nature. 493 (7434): 610. Bibcode:2013Natur.493..610N. doi:10.1038/493610a. PMID 23364736. ↑ Goldenfeld, N.; Pace, N. R. (2013). "Retrospective: Carl R. Woese (1928-2012)". Science. 339 (6120): 661. Bibcode:2013Sci...339..661G. doi:10.1126/science.1235219. PMID 23393257. 1 2 3 "U. of I. microbiologist Carl Woese elected to Royal Society". News Bureau, University of Illinois at Urbana–Champaign. 2006-05-19. Retrieved 2009-03-02. 1 2 3 4 5 6 7 Woese, C. R. (2005). "Q & A". Current Biology. 15 (4): R111–R112. doi:10.1016/j.cub.2005.02.003. PMID 15723774. 1 2 3 4 "Carl R Woese, Professor of Microbiology". University of Illinois at Urbana–Champaign. Archived from the original on February 13, 2010. Retrieved February 16, 2010. 1 2 3 4 5 6 7 8 Sapp, Jan A. (2009). The new foundations of evolution: on the tree of life. New York: Oxford University Press. ISBN 978-0-199-73438-2. ↑ Woese, C. R. (1960). "Phage induction in germinating spores of Bacillus megaterium". Radiation research. 13: 871–878. doi:10.2307/3570863. PMID 13786177. 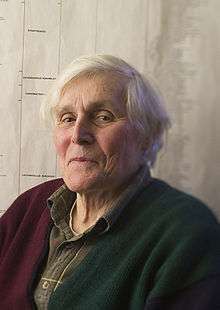 1 2 3 "Visionary UI biologist Carl Woese, 84, dies". The News-Gazette: Serving East Central Illinois. 2012-12-30. Retrieved 2012-12-31. ↑ "Carl R. Woese: 1928 – 2012". News, The Institute for Genomic Biology, University of Illinois at Urbana-Champaign. 2012-12-30. Retrieved 2012-12-30. 1 2 3 4 Nair, Prashant (2012-01-17). "Woese and Fox: Life, rearranged". Proceedings of the National Academy of Sciences. 109 (4): 1019–1021. Bibcode:2012PNAS..109.1019N. doi:10.1073/pnas.1120749109. ISSN 1091-6490. ↑ Woese, C. R. (1961). "Composition of various ribonucleic acid fractions from micro-organisms of different deoxyribonucleic acid composition". Nature. 189 (4768): 920–921. Bibcode:1961Natur.189..920W. doi:10.1038/189920a0. PMID 13786175. ↑ Woese, C. R. (1961). "Coding ratio for the ribonucleic acid viruses". Nature. 190 (4777): 697–698. Bibcode:1961Natur.190..697W. doi:10.1038/190697a0. PMID 13786174. ↑ Woese, C. R.; Hinegardner, R. T.; Engelberg, J. (1964). "Universality in the Genetic Code". Science. 144 (3621): 1030–1031. Bibcode:1964Sci...144.1030W. doi:10.1126/science.144.3621.1030. PMID 14137944. ↑ Stanier, R. Y.; Van Niel, C. B. (1962). "The concept of a bacterium". Archiv für Mikrobiologie. 42: 17–35. doi:10.1007/BF00425185. PMID 13916221. 1 2 Pace, N. R. (2009). "Problems with "Procaryote"". Journal of Bacteriology. 191 (7): 2008–2010; discussion 2010. doi:10.1128/JB.01224-08. PMC 2655486 . PMID 19168605. ↑ Sapp, J. (2005). "The Prokaryote-Eukaryote Dichotomy: Meanings and Mythology". Microbiology and Molecular Biology Reviews. 69 (2): 292–305. doi:10.1128/MMBR.69.2.292-305.2005. PMC 1197417 . PMID 15944457. 1 2 3 Pace, Norman R.; Sapp, Jan; Goldenfeld, Nigel (2012-01-24). "Phylogeny and beyond: Scientific, historical, and conceptual significance of the first tree of life". Proceedings of the National Academy of Sciences. 109 (4): 1011–1018. Bibcode:2012PNAS..109.1011P. doi:10.1073/pnas.1109716109. ISSN 1091-6490. ↑ Mayr, Ernst (1998). "Two empires or three?". Proceedings of the National Academy of Sciences. 95 (17): 9720–9723. Bibcode:1998PNAS...95.9720M. doi:10.1073/pnas.95.17.9720. ISSN 0027-8424. PMC 33883 . PMID 9707542. Retrieved 2012-01-16. ↑ Sapp, Jan A. (December 2007). "The structure of microbial evolutionary theory". Studies in History and Philosophy of Science Part C: Studies in History and Philosophy of Biological and Biomedical Sciences. 38 (4): 780–95. doi:10.1016/j.shpsc.2007.09.011. ISSN 1369-8486. ↑ Kelly, S.; B. Wickstead; K. Gull (2010-09-29). "Archaeal phylogenomics provides evidence in support of a methanogenic origin of the Archaea and a thaumarchaeal origin for the eukaryotes". Proceedings of the Royal Society B: Biological Sciences. 278 (1708): 1009–1018. doi:10.1098/rspb.2010.1427. ISSN 0962-8452. ↑ Stetter, Karl O (2006-10-29). "Hyperthermophiles in the history of life". Philosophical Transactions of the Royal Society B: Biological Sciences. 361 (1474): 1837–1843. doi:10.1098/rstb.2006.1907. ISSN 0962-8436. ↑ Woese, C. R. (2006). "How We Do, Don't and Should Look at Bacteria and Bacteriology". The Prokaryotes. pp. 3–4. doi:10.1007/0-387-30741-9_1. ISBN 978-0-387-25476-0. 1 2 3 Woese, Carl R. (2002-06-25). "On the evolution of cells". Proceedings of the National Academy of Sciences of the United States of America. 99 (13): 8742–8747. Bibcode:2002PNAS...99.8742W. doi:10.1073/pnas.132266999. PMC 124369 . PMID 12077305. ↑ Woese, C. R.; Fox, G. E. (1977). "The concept of cellular evolution". Journal of Molecular Evolution. 10 (1): 1–6. doi:10.1007/bf01796132. PMID 903983. ↑ Buchanan, Mark (2010-01-23). "Evolution, but not as we know it". New Scientist. 205 (2744). pp. 34–37. ISSN 0262-4079. ↑ Woese, C. R.; Olsen, G. J.; Ibba, M.; Söll, D. (2000). "Aminoacyl-tRNA synthetases, the genetic code, and the evolutionary process". Microbiology and molecular biology reviews. 64 (1): 202–236. doi:10.1128/MMBR.64.1.202-236.2000. PMC 98992 . PMID 10704480. ↑ "Selman A. Waksman Award in Microbiology". National Academy of Sciences. Retrieved 2011-02-27. ↑ Morrison, David (December 10, 2003). "Carl Woese and New Perspectives on Evolution". Astrobiology: Life in the Universe. NASA. Archived from the original on February 24, 2010. Retrieved February 16, 2010. ↑ Huss, Erik (2003-02-12). "The Crafoord Prize 2003 - Crafoordprize" (Press Release). The Crafoord Prize. Retrieved 2013-01-03. ↑ Zillig, Wolfram; Holz, Ingelore; Klenk, Hans-Peter; Trent, Jonathan; Wunderl, Simon; Janekovic, Davorin; Imsel, Erwin; Haas, Birgit (1987). "Pyrococcus woesei, sp. Nov., an ultra-thermophilic marine archaebacterium, representing a novel order, Thermococcales". Systematic and Applied Microbiology. 9: 62–70. doi:10.1016/S0723-2020(87)80057-7. ↑ Miller, T. L. (2002). "Description of Methanobrevibacter gottschalkii sp. nov., Methanobrevibacter thaueri sp. nov., Methanobrevibacter woesei sp. nov. And Methanobrevibacter wolinii sp. nov". International Journal of Systematic and Evolutionary Microbiology. 52 (3): 819–822. doi:10.1099/ijs.0.02022-0. ↑ Monciardini, P. (2003). "Conexibacter woesei gen. nov., sp. nov., a novel representative of a deep evolutionary line of descent within the class Actinobacteria". International Journal of Systematic and Evolutionary Microbiology. 53 (2): 569–576. doi:10.1099/ijs.0.02400-0. Search Results for author Woese CR on PubMed. Woese, Carl R. (2005). "Q & A". Current Biology. 15 (4): R111–2. doi:10.1016/j.cub.2005.02.003. PMID 15723774.